OTELLO GAGGI, an Anarchist, has lived for 13 years in Russia, having gone in exile from Italy. Has been in prison since January 4, 1935. Has still to undergo 30 years of imprisonment in Italy for revolutionary activities. He was sentenced without any trial whatsoever, to deportation for three years to Yarensk. Afterwards his wife was also sentenced, but not to Yarensk. Yarensk, situated 140 miles from the nearest railway, is buried under snow for 6 months of the year! From: The Guillotine at work p621. On June 24, 1929, the Secretariat of the International Working Men’s Association sent a registered letter to the Soviet of Peoples Commissars, asking the reason for the arrest of the Italian Anarchist Francesco Ghezzi and urging his release. Up to now no answer has been received. We hereby call public attention to his case and at the same time repeat our demand for his liberation. Francesco Ghezzi was prosecuted by the Italian courts on the charge of alleged participation in the Mailand explosions, in 1920. He was sentenced-in his absence-to 20 years servitude. In 1921 Ghezzi was arrested in Germany, and Italy demanded his extradition. The German Ministry of Justice refused to extradite him, on the ground that the prisoner was a political refugee and the charges against him of a political nature. Ghezzi was freed by the Berlin authorities, but was ordered to leave the country within three days. As the Soviet Government had repeatedly declared that it would give refuge to all proletarians persecuted in capitalist countries, Ghezzi decided to go to Russia. There, he felt, he would be safe from persecution. The Russian embassy in Berlin issued to him official documents of a Russian citizen. In Russia Ghezzi lived and worked as one of the proletariat. But he remained true to his Anarchist convictions and that proved his undoing, because in Soviet Russia there is no liberty of thought and free expression of opinion is not tolerated. 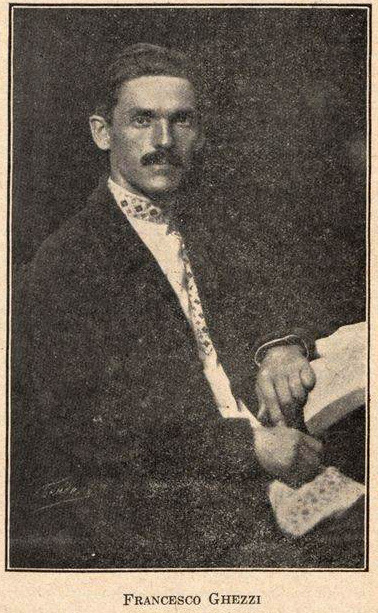 Like numerous other Anarchists and revolutionists before him, Ghezzi was arrested by the G. P. U. and condemned administratively (without hearing or trial) to three years prison in Suzdal. The imprisonment of Francesco Ghezzi is more than an ordinary outrage against the freedom of speech and thought; it is a direct demonstration that the Russian Government has betrayed its solemn promise to give asylum to the proletarian victims of political persecution in bourgeois countries. We hereby again voice our demand that the Bolshevik authorities make known the reasons for the arrest of Ghezzi, and that he be liberated at once. At the same time we call attention to the fact that the belief of revolutionary workers who are hounded in capitalist countries that they will find refuge in Russia, has been fundamentally shaken by the fate of Ghezzi. On this occasion we also repeat our oft-made demand that the Soviet Government cease its persecution of the revolutionary elements and free the thousands of politicals imprisoned and exiled in Russia. This letter of the I. W. M. A. was forwarded to Russia signed by internationally known names, among them ERNST TOLLER, HEINRICH MANN, KATE KOLLWITZ, Professor OPPENHEIM, OSCAR MARIA GRAF, G. FYSOLD, ALEXANDER GRANACH, and others. From: The guillotine at work, p593-4. These photos are housed at the International Institute of Social History, and they’d like a copy of any print publications they appear in (for their library). The initial identification work was done by the Kate Sharpley Library. Can you put names of any other faces? In addition to his ability to think clearly Ghezzi has for 20 years been a man of action, a revolutionist of the classic type. In Italy, he took part in every revolutionary mass movement, always among the first in the face of danger. Many times he was persecuted and imprisoned, but the tortures and suffering helped to strengthen his anarchist faith. At the outbreak of the world-war he opposed this war definitely and concretely – he flatly refused to bear arms. He crossed the border to Switzerland, where he reinvigorated his Anarchist and anti-war activities, for which he was imprisoned for 15 months.